Manawatu is continuing to record strong economic growth, underpinned by the complementary strengths of Manawatu district and Palmerston North, and the region’s economy now exceeds $5 billion in value according to Infometrics. The latest Infometrics Manawatu Quarterly Economic Monitor reveals growing consumer spending, strong population growth and a healthy primary sector (lamb, beef and dairy prices in particular), are all key ingredients to our economic strength. The report shows dairy farmers in the region received a payout of $289 million in 2018, up on $267 million in 2017, and high prices for beef and lamb are sending healthy returns to farmers and driving exports values to record levels. Agriculture and food tech are a vital thread to our economic make up and for every dollar generated by core agrifood industries in Manawatu, an additional 64-cents is contributed to the local economy. 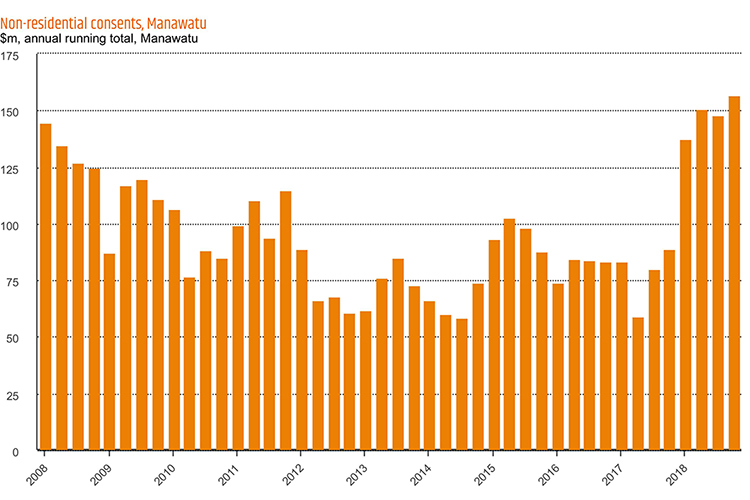 Infometrics data shows Manawatu district is New Zealand’s third most reliant district on meat exports after Waitomo and Wairoa, so when returns are good, there are significant flow on effects for the district and city. On the horizon, global political factors are creating high levels of uncertainty for primary producers, including Brexit, unsettled trade relations between the U.S. and China, and slowing Chinese and European economies, but there is little influence or control New Zealand can have. What is certain for Manawatu, is the three-billion dollars’ worth of commercial and central government investment in infrastructure and construction. This is underpinning the region’s rate of growth and there’s more on the way: Mercury Energy recently announced that in August it will begin the development of a $256 million wind turbine farm at Turitea, which is expected to create 140 jobs, while construction of the replacement road for the Manawatu Gorge begins at the end of this year, creating a further 400 to 500 jobs. Further, several Manawatu organisations have received Provincial Growth Funding, including FoodHQ, the Rural Innovation Lab, the National Driver Training Centre, a multi-modal Kiwirail Hub, and more. Construction activity and strong growth in residential and non-residential consents is providing a wall of work for local construction companies. The value of residential consents in the region grew a whopping 31 per cent in the year to December 2018, compared to 6.1 per cent growth nationally. Non-residential consents leapt up 77 per cent to reach an unprecedented $157, according to the report. The strength of the region’s economy and residents’ confidence is clear, with growth in retail electronic card spending accelerating to 5.4 per cent in the year to December 2018, compared to 4.5 per cent nationally. This is the third consecutive quarter that consumer spending growth in Manawatu has been above the national average. International visitor spending is also on the rise, up eight per cent in 2018, a slight increase on the year before. Australian visitors contributed more than half of the increase in the past year, with strong growth in spending from Canada and the rest of Oceania (which excludes Australia), too. Alongside this growth, Manawatu District Council’s Economic Development Advisor, Stacey Bell, says investment in innovation is another crucial element for the region’s economic success. “This level of investment in connecting our region and boosting the productivity of our agrifood sector will flow through Manawatu’s economy creating employment opportunities and supporting incomes across our region. CEDA’s Chief Executive Linda Stewart says Manawatu isn’t the only region to be experiencing high levels of growth and the wider community can play a crucial role in keeping building the momentum. “Central Government has identified Manawatu-Whanganui as a surge region and with this growth brings significant opportunities, as well as challenges around labour shortages, skills gaps, housing and rental shortages and rising house prices due to supply and demand. And this will only be exacerbated moving forward. While CEDA works with strategic partners to deliver programmes that attract investment, businesses, visitors and residents to the region, and grows and retains education in Manawatu, there is a lot that businesses can do themselves. “I encourage business owners and managers to engage with CEDA, our staff and resources, to identify opportunities in which we can support them to grow. CEDA’s Business Growth Advisors work with businesses across the Manawatu-Whanganui region to help them to grow. This includes free advice, connections to resources and networks, as well as training and development opportunities. CEDA is also responsible for the regional website, ManawatuNZ.co.nz, which showcases the lifestyle opportunities in Manawatu and inspiration on all that there is to see and do. Businesses can incorporate this content into recruitment efforts for example, to show the lifestyle opportunities that are here. “Showcasing and demonstrating the activity, investment, and vibrancy of our region goes a long way to dispelling the myths and perception people may have of the city and district. Big commercial projects – and we have many underway or on the way – spin off several positives from the obvious like more jobs, to the flow on effect of increased use of other services from health, education, training, accommodation, spending at local shops, restaurants, cafes and more. Infometric Manawatu Quarterly Economic Monitor. 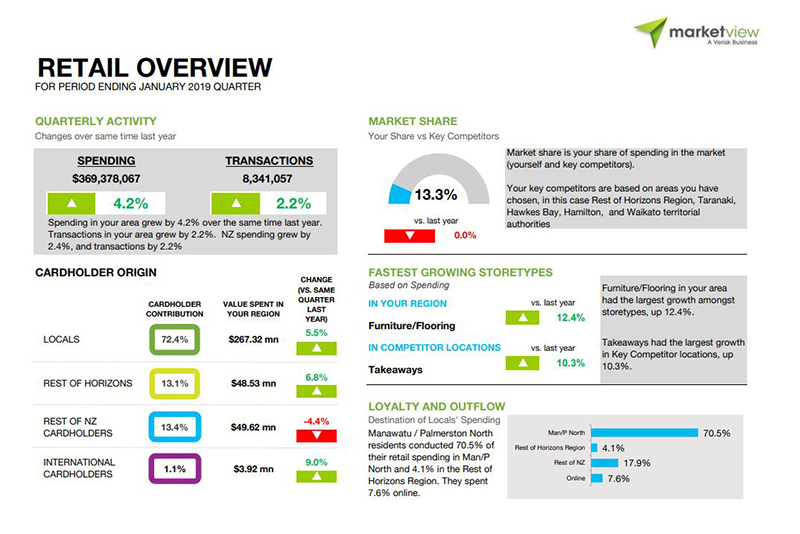 Marketview Manawatu Region Quarterly Report.